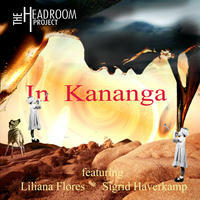 The Headroom Project : In Kananga. In Kananga transports the heat, pure power and color of West/Central Africa between Tanger (Marocco) and Kananga (Kongo). There we meet the famous medicine man. The inseparable force of rhythm and harmonies creates floating pictures you never imagined before. The track "How to ride an elephant" explains better that any special elephant-user-guide how to do what it says. The song "Cutzi" is sung in Purepecha (the language of the Central Mexican Indians) and is an entrance to deeper meditation. Perhaps you will find here even more spiritual power than in the wise words of the medicine man. "Lovedrive" is a rare but at the same time impressive dance somewhere between industrial and trip hop. Andreas Ecker (aka The Headroom Project), designed new instrument phrases by separating the overtones from existing samples and treating them like independent notes, changing their time-lapses and pitch-curves. You can hear the results on "fragile piano suffering under micro organismas" or on "Gerome" (where the percussion hits in the background). Andreas Ecker: all instruments, arrangements, mixes. Vocals on "In Kananga"
Liliana Flores: Vocals on "Cutzi" and "Fuimos Cosmos"
Sigrid Haverkamp: Vocals on "Lovedrive" and "Outside"
License Vivid world-electronica grooves by The Headroom Project for your project. Play the music of The Headroom Project in your restaurant or store.